The Gala Dinner will take place at the Hacienda Suite, 7.00-11.00 pm. In many ways it will be the highlight of this wonderful conference. The Hacienda Suite is a wonderful space and ambiance. It will be a time of celebration and music as well as a three course banquet. Before the Gala Dinner there will be pre-dinner drinks which will take place 6.30-7.00 pm which will provide a time for connection and informal conversation with friends and newcomers alike. At the time of writing the music will comprise of hopefully a String Quartet and other musical entertainment. Cost is £35 which includes pre-dinner drinks, food and entertainment. 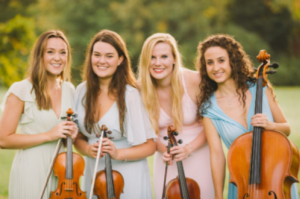 Grazia Strings are a professional classical and electric string quartet and are one of the UK’s leading string ensembles. They have worked with artists such as Olly Murs, Clare Teal and Gregory Porter and performed at various prestigious venues around the country including the Royal Albert Hall, the Grosvenor Hotel, the Sage at Gateshead, Snape Maltings Concert Hall, Manchester Town Hall and Liverpool Philharmonic Hall. They will be performing at the MIP Gala Dinner on Saturday evening from 8.00-9.00 pm.